ATC UPA-200-Div2-12 30 mm Fiber Optic Power Alert Voltage Detector. The ATC UPA power alert has a Div. 2 hazardous rating and is UL and CSA listed. 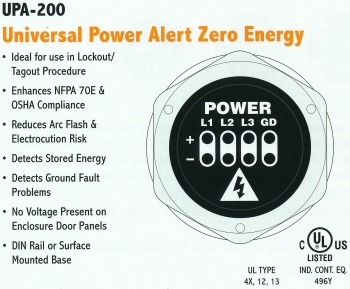 The ATC UPA-20012-Div2 Power Alert reduces the risk of electrical arc flash by pre-verifying the electrical isolation from outside of a control panel. Hard wired to the circuit breaker or main disconnect, the UPA flashes whenever voltage is present. Engineered with redundant circuitry, the Power Alert is powered by the same voltage that it indicates.